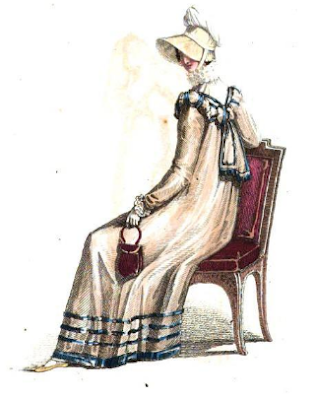 here are some more prints of clothes that were very fashionable in the last months of 1816. I find the ball dress delightful, but I’m not sure about the rest… Mmm.. What do you think? A GOWN of lilac sarsnet, cut low round the bust, which is trimmed with pink ribbon, disposed so as to form a wreath; the shape of the back is marked by bands of pink, and a large bow, in the French style, ornaments the middle of it at bottom. The back is full; a plain light front forms the shape in a most becoming manner. Long full sleeve, composed of clear muslin, trimmed at the wrist with a single row of lace, and finished by a pink bow. Fichu to correspond, very full trimmed round the throat with lace. 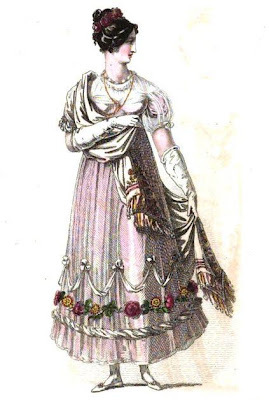 The bottom of the skirt is edged with pink, and trimmed with a single flounce of blond lace, set on very full, and surmounted by a wreath of French roses. Cornette composed of tulle, finished by a quilling of blond round the face, and fastened by a pink bow under the chin; a bow to correspond ornaments it on the forehead, and a bunch of flowers is placed very far back on the head. The style of this cornette, though French, is so simply elegant and becoming, that we have not for some time seen any half-dress cap to equal it. Plain gold ornaments. White kid gloves, and white kid slippers with pink rosettes. A gown, composed of white gauze, of an exquisitely beautiful and glossy texture: it is worn over a maiden-blush slip. For the form of the dress, which is in the highest degree novel and elegant, we refer our readers to our print. The trimming is a rich rollio of intermingled gauze and satin at the bottom of the dress, above which is a wreath of fancy flowers, and this wreath is surmounted by white satin draperies: the general effect of this trimming is uncommonly tasteful and striking. The hair is much parted on the forehead, and dressed very low at the sides; and the hind hair, brought up very high, forms a tuft. Head-dress, a wreath of French roses, placed so as apparently to support the hind hair. Necklace, bracelets, and ear-rings of pearl. White kid slippers and gloves. We have to thank the condescension of a lady, one of our subscribers, for both the elegant dresses which we have given this month. 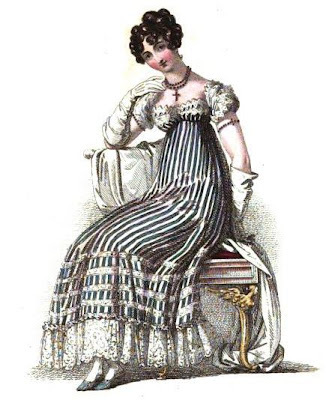 A lilac and white striped gauze dress over a white satin slip; the bottom of the skirt is ornamented with five rows of white silk trimming, of a very light and elegant description: it has just been introduced, and the pattern has more novelty than any thing we have seen for some time: a single flounce of deep blond lace completes the trimming. The body is also very novel; the upper part is formed of lace, and the lower of gauze, to correspond with the dress: the latter is quite tight to the shape, but the former has an easy fulness, which forms the shape in a manner extremely advantageous, to the figure. 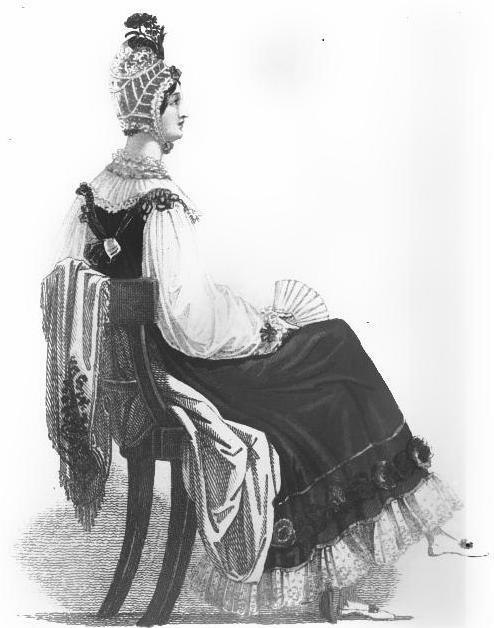 The sleeve is short and very full; it is composed of lace, looped high, and finished by a trimming to correspond with that on the skirt. The hair is full dressed, without any ornament. Necklace, cross, armlets, and bracelets of rubies. White satin slippers, and white kid gloves. A High dress of cambric muslin trimmed at the bottom with a single flounce of work. The body, which is composed entirely of work, fits the shape without any fulness. A plain long sleeve, finished by a triple fall of narrow lace. Over this dress is worn the Angouleme pelisse, composed of crimson velvet, lined with white sarsnet, and trimmed with a single welt of crimson satin, a shade lighter than the pelisse. The body is made exactly to the shape; the back is of course a moderate breadth, and without fulness; for the form of the front we refer our readers to our print; it is confined at the waist, which is very short, by a narrow velvet band, edged to correspond. A small collar, of a novel and pretty shape, stands up and supports a rich lace ruff, which is worn open in front of the throat. The sleeve has very little fulness, and that little is confined at the wrist by three narrow bands of puckered satin. Bonnet a la Rouale, composed of white satin, very tastefully intermixed with a large bunch of fancy flowers, and tied under the chin by a white satin ribbon, which is brought in a bow to the left side ; a full quilling of tulle finishes the front. Black silk ridicule, exquisitely worked in imitation of the ends of an India shawl, and trimmed with black silk fringe. White kid gloves, and black walking shoes. A gown of pale faun – colour cloth, made a walking length, and trimmed round the bottom with four rows of rich blue silk trimming. The body, which is cut very low, is ornamented in such a manner as to have a novel appearance, with a similar trimming, but very narrow. The back, which is cut down on each side, is finished at the bottom of the waist by bows and long ends, trimmed to correspond. A very tasteful half sleeve over a plain long sleeve, made tight at the wrist, and hound with blue trimming; it is finished by a narrow ruffle composed of three falls of tulle; fichu of tulle, with a ruff to correspond. When worn as a carriage dress, the head-dress is a bonnet, the crown composed of white satin at top, and the middle and front of Leghorn; it is lined with white satin, and ornamented only by a white satin band and strings. An India shawl is also indispensable to it as a carriage dress, for which it is elegantly appropriate. Shoes and gloves pale faun colour. Our dresses this month are both French; but, as our readers will perceive from onr prints, they are in the best style of Parisian costume. We have been favoured with them by a lady who has just returned from Paris. Was Mary Boleyn Really The Mistress Of King Francis I Of France?